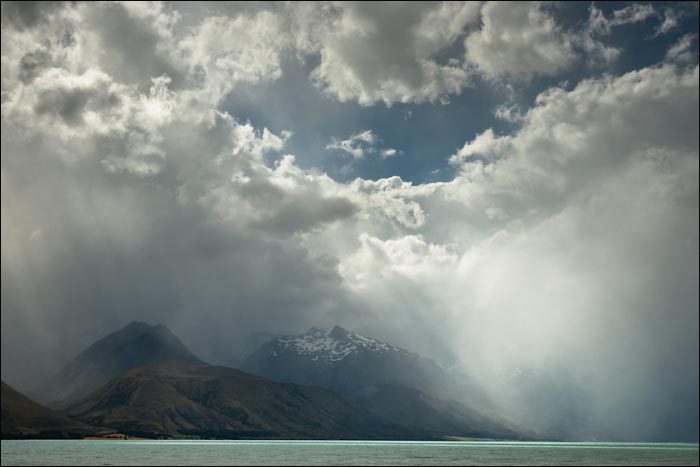 On my way… towards the Southern Alps of New Zealand and chasing the fury of a westerly storm. I recall the highest wind gust recorded in New Zealand, 250 kph at Mount John beside Lake Tekapo (my back door) in 1970. Today is surely a threat to that record. Standing up, opening and closing a vehicle door was simply life threatening. This is yet another reminder of the wrath of nature and in these moments of fleeting weather and light, I am constantly inspired. The ferocity of the wind makes use of a tripod irrelevant and I look for anything heavier than a man to brace against. The continually changing elements of light, colour and form in a composition is not so much a hindrance, but an opportunity to capture a fraction of infinite possibilities speedily presenting themselves. Tip: Look at scenes like this through polaroid sunglasses, whether or not you are looking for compositions with a photographic eye you will enjoy the view with much stronger contrast. A few hours later I return to Lake Tekapo to find out the wind gust record was indeed under threat with gusts of up to 230 kph recorded.